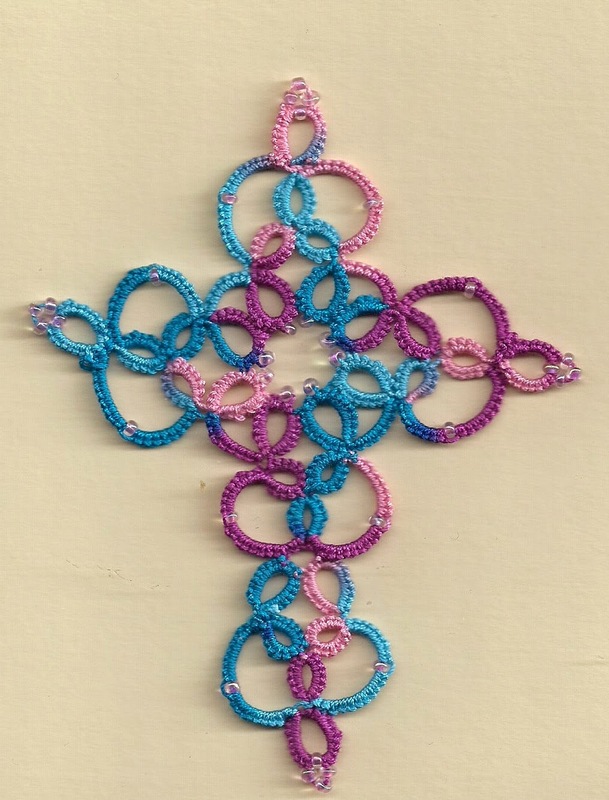 I gave this piece of tatting away on Friday it is is Mary Konior's Rockingham cross, didn't particularly like the design, it probably would have looked better in a plain colour. We needed a practical way of storing all the wood which has come our way lately, instead of piling it up behind the garden shed! So 'im in the garage' came out from the garage and made a little house for it all. Having such large pieces means that not only shuttles can be made but other interesting wooden items. I’ve always liked the Rockingham Cross! Have tatted it several times and I agree with you... It does look best in a single colour. Just as I thought about the cross, must tat it again! Ohhh... The table is just Superb!!! Congratulate him in the garage please!! And I love the colours in the cross!! Hope the recipient did too!!! Will do! Yes the recipient was pleased as she had not seen anything like that tatted before - only knew about the craft. 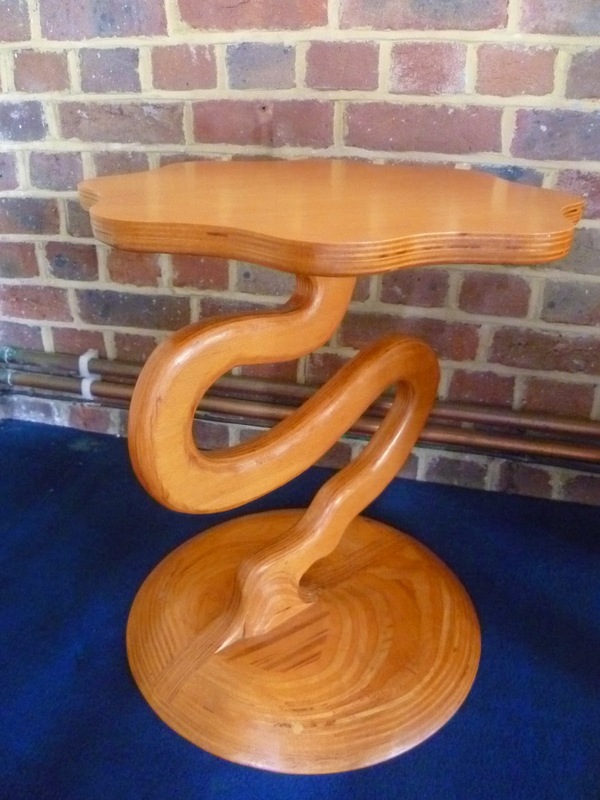 Hi Sally, thank you so much for taking time to post the photograph of the beautiful table, very envious! What wood is it made of? Did 'I'm in the garage make it? I like the way you've captured your logs. I expect log-arithms will be used to decide how many shuttles will be made. Did you nip down to help the Queen launch Britannia? Not sure about the wood, but what it is is lots of bits put together (liminated) and then the whole thing shaped. Yes 'im in the garage' did make it when we lived in Germany, at that time he went to a night class as we were unable to have all the tools at home because of always being on the move. No Anne did not see the Queen launch the ship, too much traffic and people around, it would have been different if I had received an invitation - must have got lost in the post! That's a beautiful way to store wood, and that table is fabulous! Diane I was a bit worried that the wood store would look ugly but it doesn't and is just right against a very boring brick wall. The table is wonderful! - and so is the wood-holder. Have you seem the marvellous set of tatting drawers that someone's clever husband made? - it's somewhere on the Facebook pages, maybe another commenter will remember the name. The bottom drawer was specially configured to hold a blocking doily! Yes I have Maureen - such a labour of love, some very clever husbands out there. The table is beautiful! The wood 'storage' looks very nice - artistic, really, the way the wood is displayed. Thanks Stephanie, yes I guess it does look artistic and natural.